In 1986, Five Guys opened its first location in Arlington, Virginia as a family-run restaurant named after, you guessed it, five brothers. Renowned for their fresh, high-quality food, Five Guys expanded quickly and now have more than 1,200 franchises across the US, Canada, England, and Scotland—with plans to move into Europe and the Middle East in the next year. With over 30,000 employees (of which 250 work for the corporate office), the company wanted to reconcile the potential disconnect between its multinational brand power and the family-owned persona that resonates with its loyal customers. The Five Guys online strategy, led by Online Marketing Specialist Kenneth Westling, decided to focus primarily on social media for the bulk of their promotional activities, including customer service and public relations, rather than traditional print, radio, and TV advertising. By connecting directly with customers instead of talking at them, the marketing team hoped to keep the unique Five Guys voice as fresh, exciting, and authentic to new audiences as the already-engaged customer base in the US. Hootsuite helps Kenneth stay aware of what Five Guys customers are saying on various social networks. The streams layout in the Hootsuite dashboard show social posts related to brand and services keywords, making it easy for the team to flag and share any inbound comments or questions with the right Five Guys corporate team member. Kenneth cites the “who responded to last message” feature on the Hootsuite mobile app (Mobile Assignments) as particularly useful when managing the workload. Kenneth liaises daily with the Five Guys’ customer service manager to exchange client feedback and get a sense of the overall feeling towards the brand. This information gives him a deeper understanding of the Five Guys’ audience, so he can create content that directly addresses feedback and will nurture customer relationships, boosting sentiment. Social media can give you a wealth of information not available through other traditional communication channels, such as how people feel about your brand, which products are the most popular, and even the geographic and/or demographic distribution of buyers. As the Five Guys franchise has expanded across continents, their menu and services have—at times—evolved to cater to their customers’ needs on a local level. Hootsuite’s geo-targeting functionality has allowed Five Guys to monitor specific conversation topics as they happen, in specific areas of interest. By first setting up a good listening strategy, and then breaking it down by location, the Five Guys team has been able to gain deeper understanding into what is working and what’s missing the mark across their global markets, as well as sentiment around individual campaigns or initiatives. To learn more about Five Guys and geo-search, check out this blog post. The Five Guys main Twitter account, @Five_Guys, is used for engaging with customers, answering queries, and providing information about the brand and new store openings. Individual franchise locations, however, are also given dedicated accounts to communicate locally on promotions, new flavors or products, and events that resonate with the community. Employee interaction is encouraged and appreciated. By empowering franchisees to communicate and collaborate on an international scale, individual branches can uncover customer feedback themselves, respond directly, and make changes that improve the customer experience. And because the Five Guys brand is genuine, personal, interesting (and interested! ), Kenneth and his team wanted to celebrate the “crews”—franchise employees—by giving the public a “behind-the scenes” peek into their worlds through photos and videos. The “Pursuit of Perfection Tour” campaign, tracked with the hashtag #HighFive, has proven enormously successful and is now an ongoing social initiative. Just a glance at Five Guys’ well-established Facebook, Twitter, and Instagram networks shows a company that puts the focus on its customers, sharing photos, quotes, and reviews from their clients. Content is user-generated, whether it comes from social contests or feedback gained through customer service. Let’s take a look at some of Five Guys’ social campaigns. #SayCheeseSweeps is one of their recent successes, with more than 1,000 total mentions on Twitter and Instagram. Customers hashtagged photos of themselves with Five Guys Cheeseburgers for a chance to win prizes, and these photos were shared across the Five Guys networks. 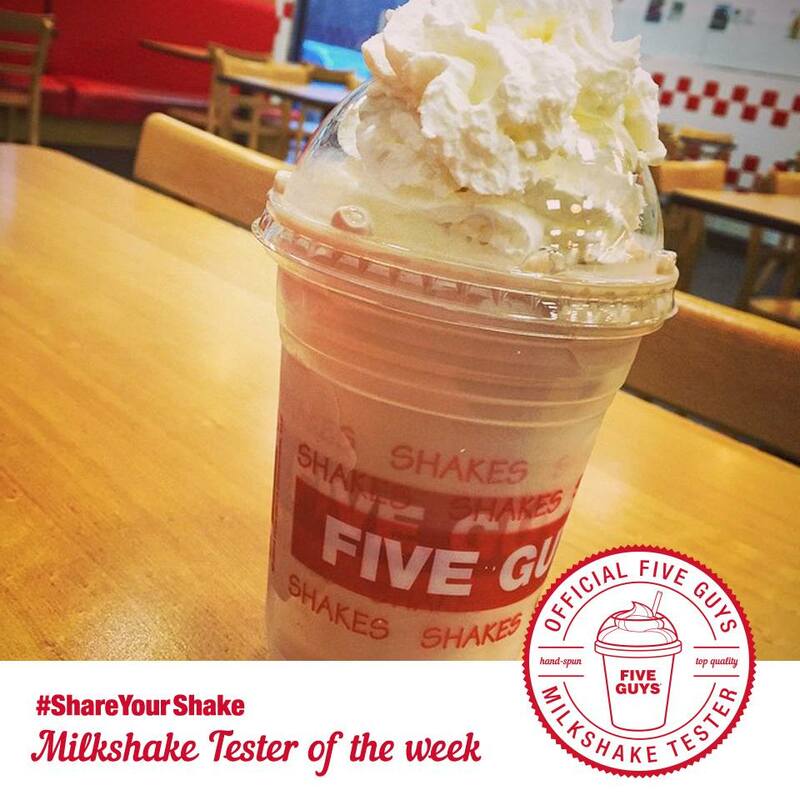 Audience participation was even greater than expected, so the team recreated the campaign with milkshakes, using the hashtag #ShareYourShake. All promotional posts were scheduled and tracked in the Hootsuite dashboard. Kenneth tracks campaign engagement numbers using Hootsuite Analytics. Engagement is the company’s driving metric, so Kenneth creates internal reports through Hootsuite Analytics on likes, shares, reach, best engagement times, and days of high engagement. This kind of quantitative data is invaluable for showing the return on investment in social initiatives, and helps inform future campaign planning. Satisfied customers often become brand ambassadors. Social campaigns are a great way to generate buzz and sharable content from an audience that best knows your products and services—your happy customers. Use social media to connect with your growing audience.